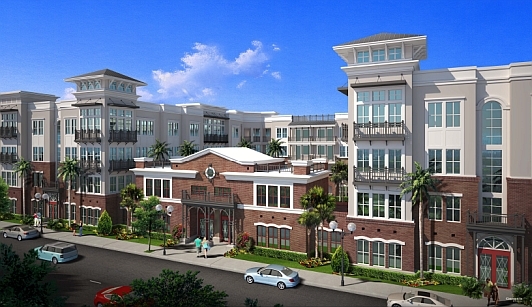 A low rise all-residential development will be constructed in Tampa’s historic Ybor City, an eclectic neighborhood that was once the home of a booming cigar rolling industry and now home to a broad mix of retail, service industries and residences. Entertainment venues and restaurants dot every block of this community. Ybor City is home to both the oldest Tampa Italian social clubs, Cuban social clubs and even several of Tampa Pirate Krewes who have come to shore to sponsor dozens of local charitable organizations. This development is designed specifically to meet the needs of the neighborhood with a combination of affordable studios plus one, two and three bedroom apartments. A ground floor garage will alleviate the risk of adding congestion to the already busy local streets. It will be architecturally consistent with the design heritage of Ybor City including wrought iron railings reminiscent of adjoining buildings from the early 1900’s.